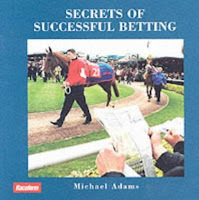 Secrets of Successful Betting just looks like a stocking filler put out by Raceform. However, it is packed with 23 chapters, full of useful information. The first two chapters give a very complete history of the origins of bookmaking, followed by the mechanics of the modern betting market. Chapter three covers hedging, be it photo finishes, ante-post, price coupling or a backer's book. Staking systems are covered in chapter four with confirmations of my belief in upping your bets when you are ahead and pulling back when you are losing. You won't see mention of Martingale or Fibonacci. Progressive, proportional and Kelly staking are all covered. Your bankroll is covered in chapter five, covering psychological aspects too. Multiple and each-way bets are covered in chapters six and seven. All aspects of handicapping are covered in chapters eight to thirteen. As my regular readers will know, this is not a subject that I care for, greatly, so I am not qualified enough to comment on these chapters. Needless to say a thorough account of conditions and selection systems is given. Also there is mention of losing run probabilities. Even a winning system has its bad days. Chapter fourteen covers estimation of win and place chances with an easy to read treatise of the Harville place pricing model. British and Irish race courses are covered in chapter fifteen. Chapters sixteen to twenty-three cover much reference material that can yield new ideas. This is not a book for those looking for an Ainslie or Beyer style handicapping book. However, the book covers the mechanics amd mathematics of bookmaking more precisely than any other book that I have read. For the beginner it is a must read and for the expert it can yield some gaps in your knowledge. Phil Bull wrote a good book on Bookmaking many years ago, it included tic tac signals. AW racing, betting exchanges, computers, etc. This new book, as you say sounds good for beginner and fill gaps for the older hands.